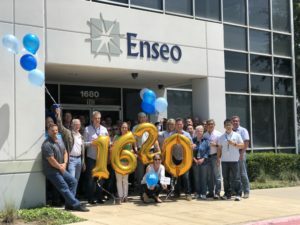 Richardson, TX – Aug. 21, 2018 – Inc. magazine revealed that Enseo, Inc. has once again been recognized as one of the nation’s fastest-growing private companies. This is the third time for Enseo to rank on the Inc. 5000. The list represents a unique look at the most successful companies within the American economy’s most dynamic segment—its independent small businesses. Enseo is one of the fastest growing technology companies in the country. For 18 years, Enseo has delivered sustainable innovation to hospitality, education, hospitals, and government installations. In addition, Enseo powers and manages the world’s largest fully-monitored out-of-home media network, reaching 50 million people annually. Enseo offers four core products in one platform: In-room entertainment, high-speed internet, room control (IoT), and the MadeSafe® panic button solution. Enseo has been recognized for excellence as the 18th Best Entrepreneurial Company in America by Entrepreneur Magazine’s Entrepreneur 360 List, the 10th Fastest-Growing Women-Owned/Led Company by Women Presidents’ Organization (WPO), and listed three times in the Inc. 5000. For more information, visit www.enseo.com.